101 Sheet Mask Guide - Best Brands, DIY Masks and Disney?! Rewind two years and you would have struggled to have found a single sheet mask in-store, anywhere (I'm talking UK here, FYI). They just didn't exist. Granted they were on many a celebrity face via Instagram and constantly talked about on Korean beauty blogs but here, we had zilch! Thankfully we are all caught up now with some of the major players in the skincare world offering high-end options, to ASOS stocking 15 different sheet masks and Garnier releasing a budget option at only £1. But do we really know what we are doing when it comes to using sheet masks? Which are the best brands to go for and do they actually make a difference? As I've been totally converted to using sheet masks in the past 6 months I thought I'd share the low-down on them. From choosing a sheet mask right for your skin type to what to do with excess serum and even how to create your own DIY mask! Consider this a complete guide to sheet masks! Unlike a traditional wash-off face mask, sheet masks are often a more intense way to pep up the skin. Sheet masks are normally made from a thin fabric or tissue but in some cases are made from a slightly weird thick gel (normally gold style masks) and infused with a serum that will penetrate the skin. Unlike standard masks, sheet masks are mess-free and don't require washing off. For that reason they are ideal for travel or if just don't love the mess factor on traditional face masks. Generally, sheet masks are good to use once a week, due to the price point, but you can use them as often or as little as you like. For some reason when the sheet masks trend hit the UK I went for any that took my fancy, regardless of if it would benefit my skin type! I haven't a clue why I would do this because it's definitely not something I would do when buying a traditional face mask... I blame the prettiness of sheet masks actually! So my first major tip would be to opt for sheet masks that are targeted to your skin type. A lot of sheet mask aim to hydrate and brighten the complexion but there are quite a few that are suitable for blemish-prone/oily skin. You really can spend as little as £1.00 on a single sheet mask upto £20 for a high-end mask! It's totally up to you. 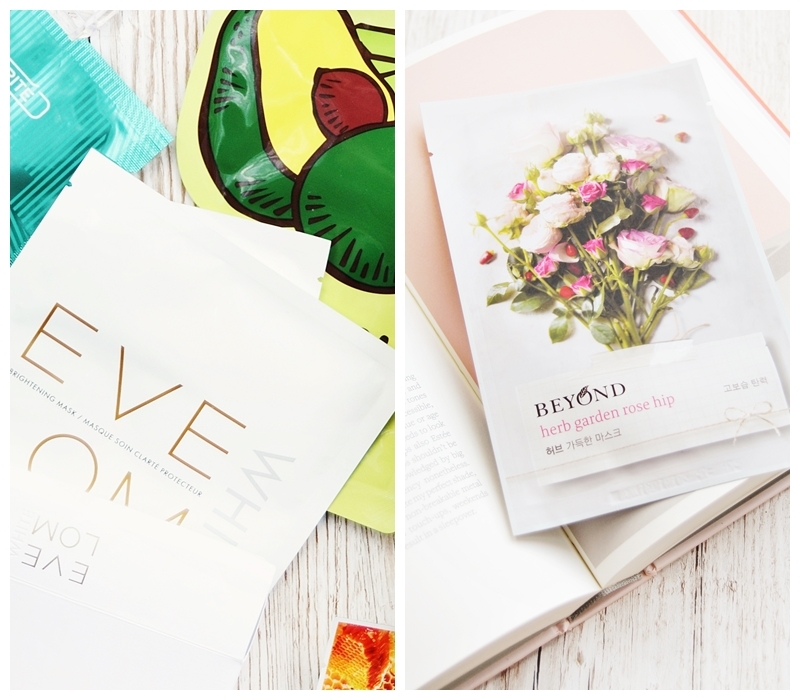 However personally I've found quite a few effective budget sheet masks that show instant results, my favourites being the above Tony Moly I'm Real Mask Sheets here (only £2.20 each with free p&p!) for how effective they are. But I've also keen on StarSkin Sheet Masks here which are a bit more of a treat but still affordable. Really it's all about the ingredients, which you may want to look into. But a key tip is to avoid any mask that contains alcohol! With any kind of face mask you want to at least wash and dry your skin prior. But for even better results exfoliating first is also a good idea. This will lead to better penetration of the serum in the mask and leave your skin feeling super smooth. But you may want to skip this if you have sensitive skin! There is also the option of using a traditional face mask first if you are wanting ultra clearing results especially if you have oily/blemish-prone skin.Toner is also suggested prior to application on many sheet masks I've used. Whatever sheet mask you go for it's an ideal time to lay back and relax. Of course you could try to multitask but anything that requires you to be anything other than horizontal isn't really going to work. That's unless you go for a clever ear looped under-the-chin style mask, they tend to be anti-aging/firming, and then you can multitask as you please, even go out shopping... okay, that's maybe too far. Standard sheet mask or more pricey ear looping mask I personally prefer to relax and enjoy my 10-20 minutes of pamper time. If you've used sheet masks before you will know that there's always extra serum left in the foil sachet. You could just toss the packet but why waste the extra good stuff? Generally I like to use the extra serum on my neck and my chest area while wearing the sheet mask, heck I've even used it on my feet before! But if I know the serum works like gold dust on my skin then I will save the sachet and it's contents and apply the serum the next morning as part of my skincare routine. Either way... don't waste it! Unlike more traditional wash-off face mask there is no need to rinse the face. Simply tap in the extra serum and you are done! However if your skin is known for breaking out or on the oily side then I would suggest rinsing the skin (especially if the serum feels quite sticky) and patting dry. 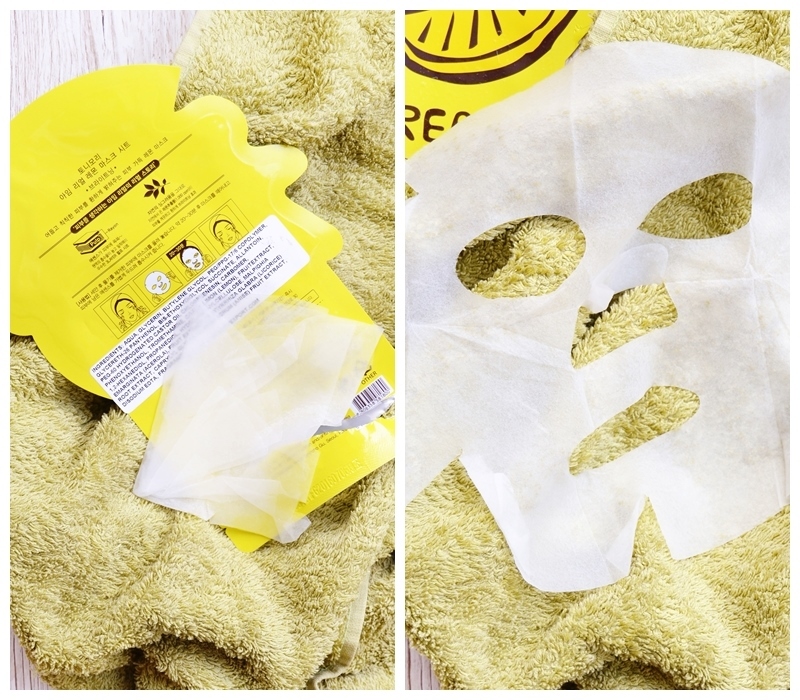 Did you know you could create your own sheet masks? This may not be for everyone and more for the sheet mask addict or beauty DIY-er but it's certainly worth giving a go. A great time to try out a DIY recipe or turn your favourite serum or traditional face mask into a sheet mask! Simply pick up some Cotton DIY Sheet Masks from eBay £1.94 for 10 here and soak them in a small bowl along with your ingredients and apply to the face for 5-10 minutes. 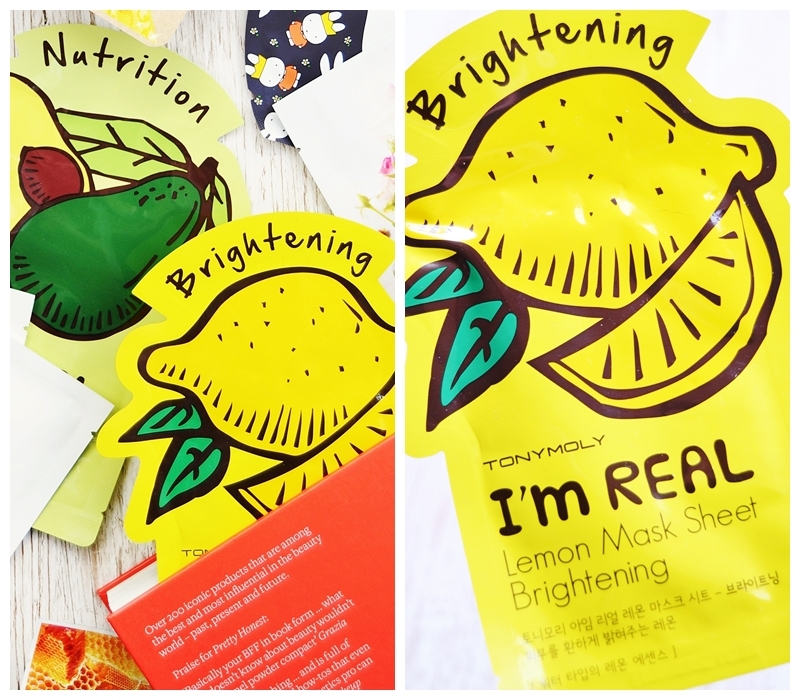 As I mentioned above I aim particle to a Tony Moly I'm Real Mask Sheet (full range here for £2.20 each or £3.80 for 2) especially the Lemon Brightening mask as it's zesty and really does brighten and pep up the skin a dream. But I have just tried my first ever DearPacker Black Tea & Black Rose Mask which is a thin gel mask (so comfortable and relaxing) infused with an pieces of black tea and a pleasant tea scent. The mask left my skin feeling firmer, smoother and brighter - money well spent! It is unfortunately out of stock but you can find the original Black Tea version (exactly the same just without the Miffy packaging) for £3.61 here. I'll definitely be picking up another in the near future! 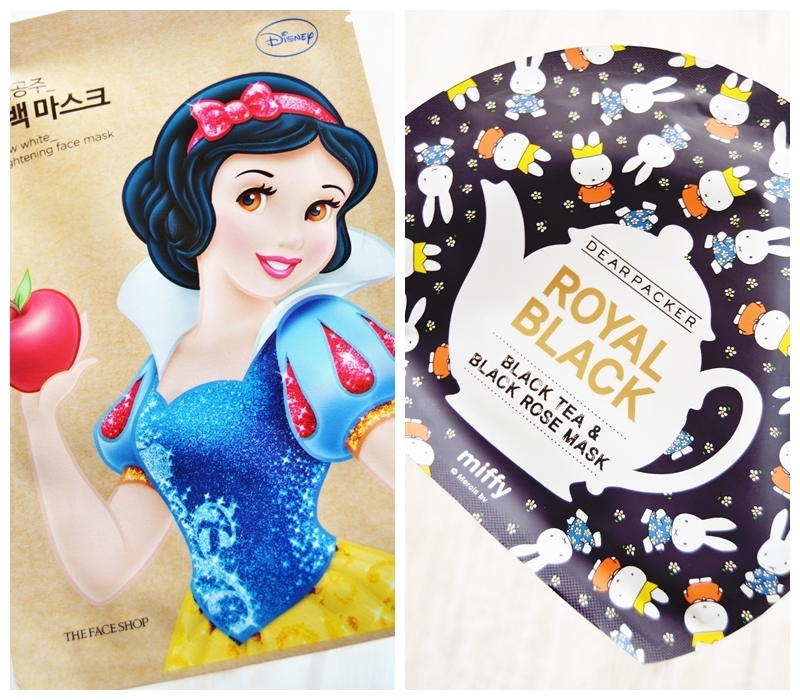 You may have also noticed the above The Face Shop Disney Snow White Brightening Mask, which I have a feeling I could get questions on! I haven't used it yet, but I think a collective sheet mask review of all my recent discoveries may be in order soon, but if you are eager to try it for yourself you can pick it up from eBay for £2.81 here along with some other amazing Disney princess sheet masks here. Okay, I'm sheet masked out! Hopefully this has covered all you need to know if you are new to trying sheet masks. If you're a fellow sheet mask addict let me know your favourite brands so I can snap up some new ones!